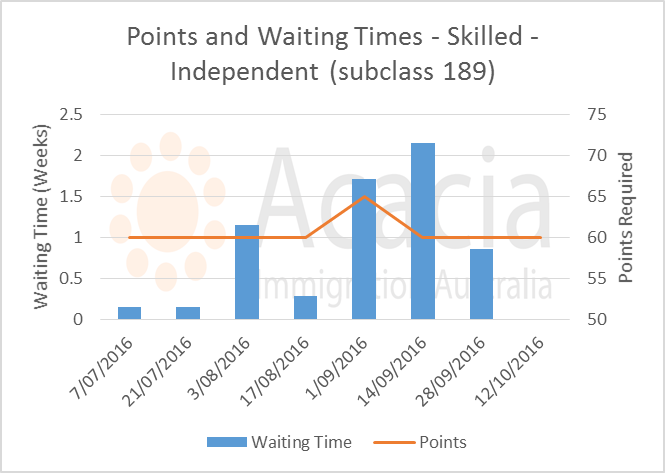 When applying for general skilled migration, the most challenging stage is usually to receive an invitation through the SkillSelect EOI system. Information is now available on 8 invitation rounds since the start of the 2016-17 program on 1 July. This is enough to give some meaningful insights - particularly for Accountants, IT professionals, Engineers and Family Sponsored 489 applicants. 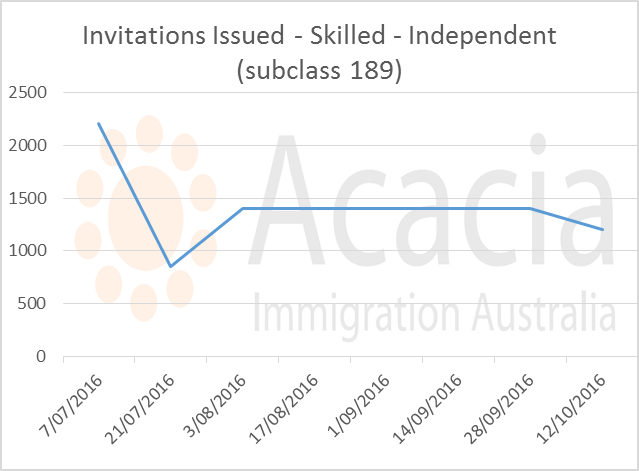 The minimum score required for applicants to receive an invitation for a Skilled Independent Subclass 189 Visa for most occupations has been 60 points for all invitation rounds so far in 2016-17, apart from the 1 September round. Waiting time for an invitation has been 2 weeks or under for the entire program year. The number of invitations issues for the 189 subclass has varied considerably over the invitation rounds so far. 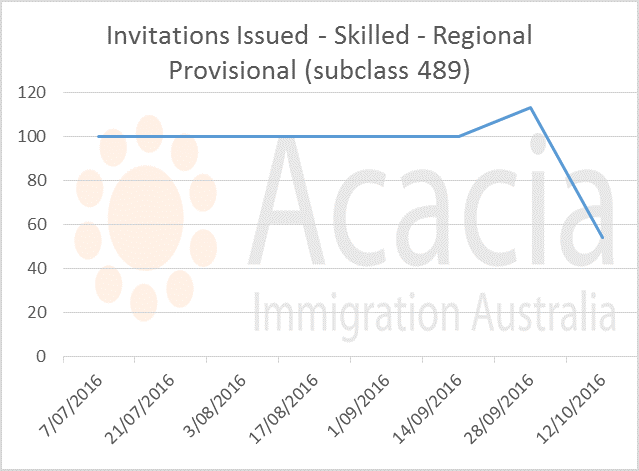 The first round on 7 July saw 2202 invitations issued, with a low number of 848 issued in the next round on 21 July to compensate. For most rounds, there have been 1,400 invitations issued and we expect the target to be 1,400 per round for the rest of the year. In the latest round of 12 October, only 1204 invitations were issued, which suggests that there are insufficient eligible 189 EOI applicants to meet the target number. There are now 6 "pro-rata" occupational groups, up from 3 last year. These are occupations where there are more EOIs lodged than can be accommodated in the occupational ceiling. For these occupations, the number of invitations issued in each round is limited so that the ceiling is not filled too quickly. As a result, the minimum points required for an invitation may be higher or the waiting time longer for an invitation. 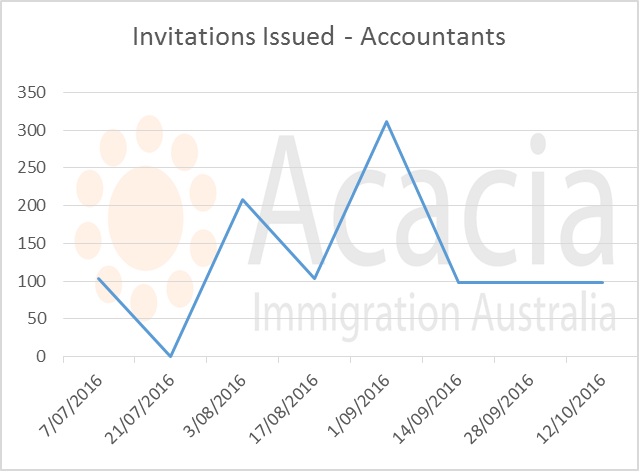 The number of invitations issued to accountants has varied widely in the invitation rounds so far in 2016-17. For most of the rounds, approximately 100 invitations were issued. However, in the 21 July round none were issued. This appears to have been a systems glitch with no invitations issued for any pro-rata occupation. 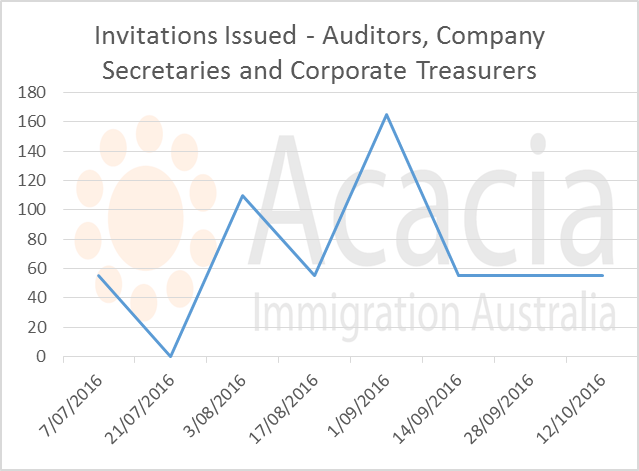 In the 1 September round, over 300 invitations were issued to accountants - this appears to have been a measure to deal with the backlog of EOIs in the system. We have now seen a stable figure of 98 invitations issued to accountants per round for the last 3 rounds. We expect the target to be around this figure for the rest of the year. 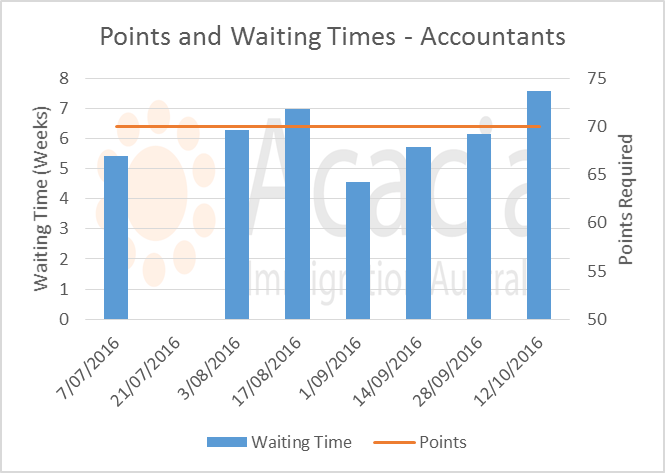 The minimum points score required to receive an invitation for an accountant has been 70 for each round so far in 2016-17.�Waiting times have varied but have generally been from 5 to 8 weeks. As waiting times are relatively stable, we suspect that the minimum score will be 70 for the rest of the program year. The situation for auditors is similar to that for accountants. Invitation numbers have oscillated but look set for a long term level of 55 per invitation round. The points required for an invitation for an auditor have been at 70 for all rounds so far. Waiting times on the other hand have varied between 1 week and 25 weeks. This makes it difficult to predict waiting time or minimum points score for the rest of the year for this occupation. 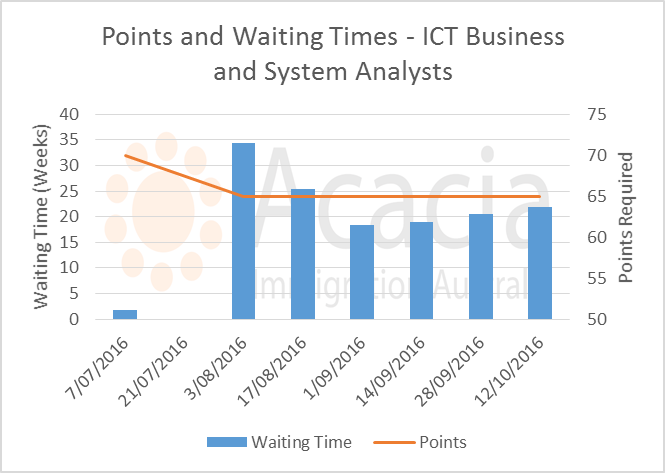 Minimum score for ICT Business and Systems Analysts has been 65 for all rounds so far, apart from the first round. 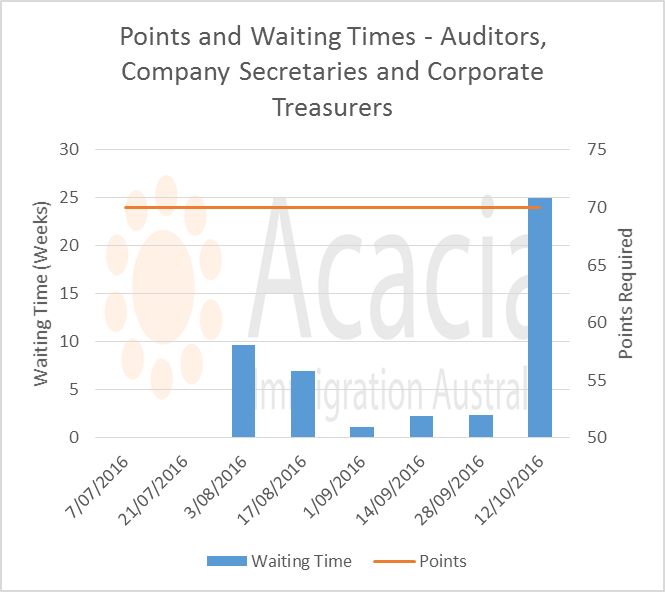 Waiting time at 65 points has been increasing gradually, suggesting the minimum score will either remain at 65 or potentially increase back to 70. 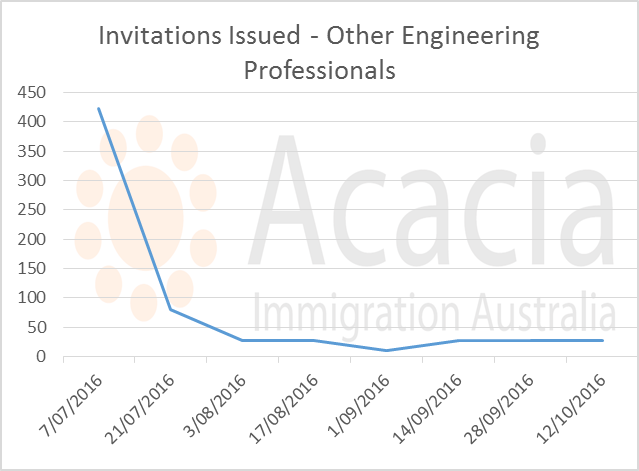 The number of invitations issued per invitation round has now stabilised to 60. 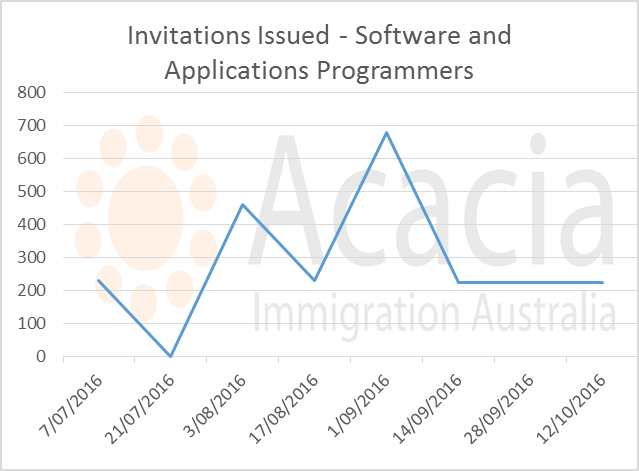 Minimum score required for an invitation for Software and Applications Programmers has been 65 for most of the year. 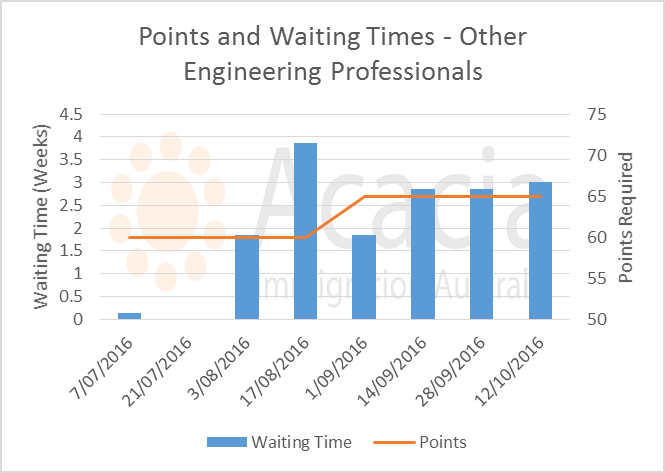 Waiting time reduced considerably between July and September, suggesting that a backlog of EOIs at 65 points or higher has cleared from the end of 2015-16. 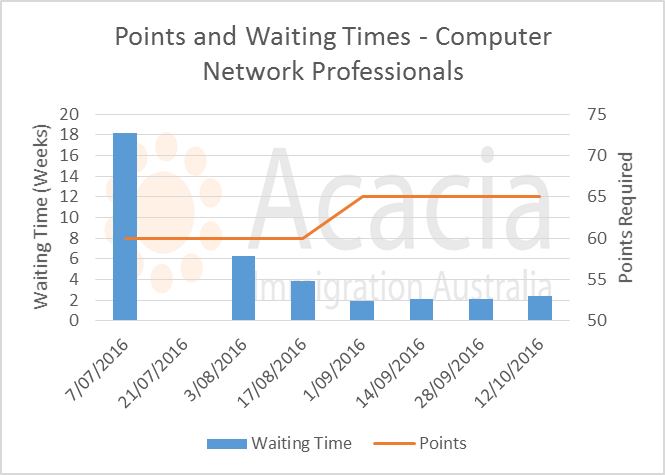 Waiting time at 65 points is quite low - under 2 weeks since September. This suggests that the minimum score will remain at 65 or possibly reduce to 60 for some rounds. The target number of invitations per round appears to be 225 for this occupation. Minimum points score for this occupation has increased from 60 to 65. Waiting time for an invitation is just over 2 weeks at the moment. As waiting time is low, we expect the minimum score to remain at 65 or possibly reduce to 60 this program year. 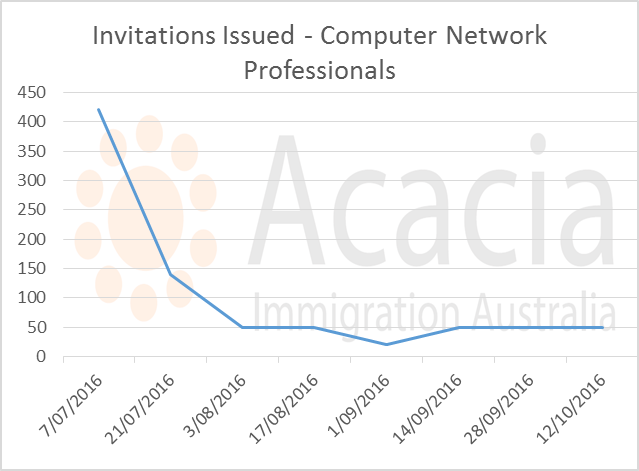 Similar to the "Other Engineering Professionals" occupation, the number of invitations issued to Computer Network Professionals was initially very high (421 on 7 July) then reduced significantly to its current level of 50 per invitation round. This occupation includes Engineering Technologists, Aeronautical Engineers, Agricultural Engineers and Biomedical Engineers. Note that other engineering occupations (eg Electrical Engineers, Civil Engineers and Mechanical Engineers) are not on the pro-rata list. Points required for an invitation have increased from 60 to 65 in the current program year. 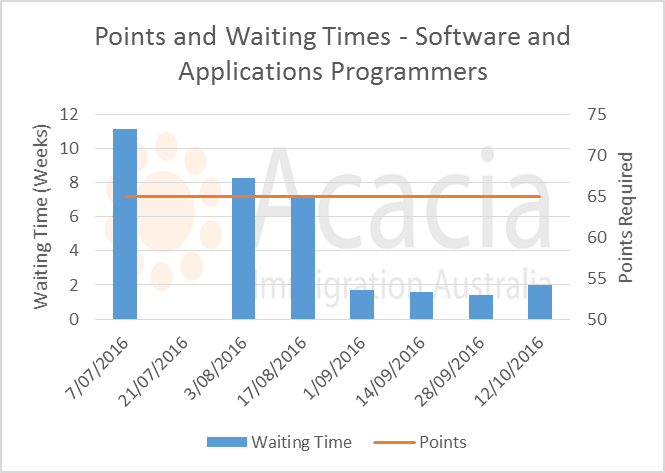 Waiting times have fluctuated but are now relatively stable at approximately 3 weeks at 65 points. 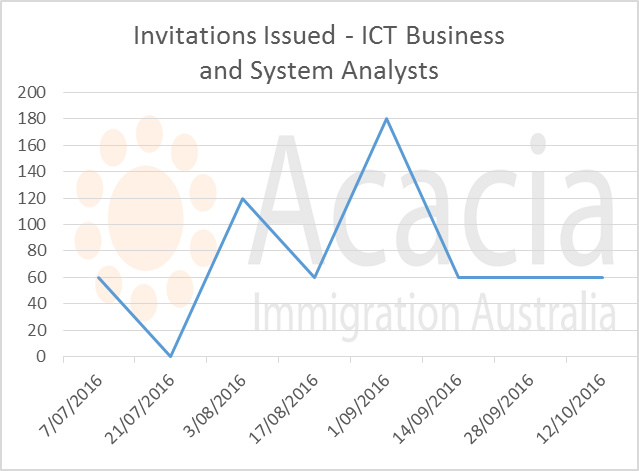 The number of invitations issued has decreased from 423 in the 7 July round down to 11 in the 1 September round. This suggests that Immigration took a while to realise that the occupation should be place on pro rata status (last year the occupational ceiling filled, but the occupation was never pro rata). The occupation is now over 65% full and as a result, the number of invitations has reduced to 28 per invitation round. The small number of invitations issued makes it difficult to predict future points scores, but we expect the minimum score to stay at 65 or possibly reduce to 60 for some rounds. The number of invitations issued to family sponsored 489 applicants has increased significantly as compared to the 2015-16 program year. For most invitation rounds so far, the number of invitations issued has been 100 per round, apart from the 28 September round (113) and the 12 October round (54 - probably due to the low number of eligible applicants). Minimum points required for the 489 family sponsored program started at 65 in July but are now down to 60. 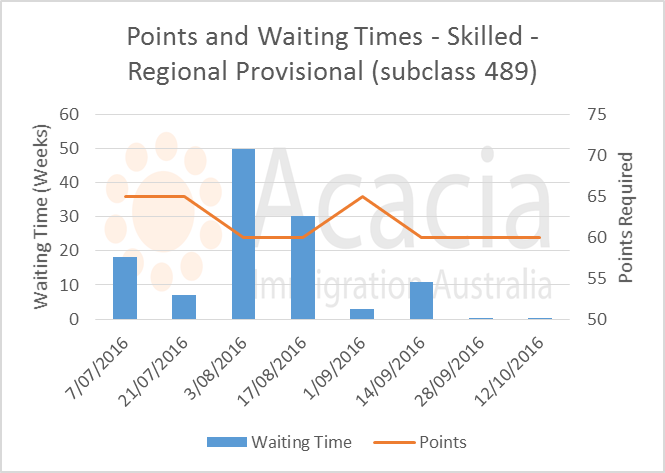 Waiting times have reduced to practically zero, suggesting that the entire pipeline of eligible applicants for 489 is empty. For a family sponsored 489, you must have an occupation on the Skilled Occupations List (SOL). Immigration is continuing their policy of giving priority to applicants for the 189 subclass when it comes to pro rata occupations. As a result, it may be difficult to obtain a 489 invitation even if you have 60 points if your occupation is on the pro rata list. If you are looking at applying for general skilled migration, your situation is quite different depending on whether you have a pro-rata occupation or not. If your occupation is not on the pro-rata list, you can expect an invitation for 189 or 489 by the next invitation round, providing you have a score of at least 60. If your occupation is on the pro-rata list, things are more competitive. Accountants and auditors require at least 70 points, and this is unlikely to change this program year. IT professionals will generally need 65 points - this is also likely to remain the same for the rest of the year, except perhaps for Software and Applications Programmers and Computer Network Professionals who might reduce to 60 points for an invitation round or two. Other Engineering Professionals are expected to remain at 65 points for the program year, but might reduce to 60 at some point. If you have an occupation on the pro-rata list, other options may be possible such as state nomination or employer sponsorship. If you would like advice on the options available to you, please book a consultation with one of our advisors and we can give you an immigration roadmap clearly explaining your options.